For those of you who live in a cave, and tell time with a sundial, let me be the first to tell you that today is Cinco de Mayo. Today is a day of drinking giant margaritas, ice cold cervezas and gorging on carne asada street tacos by the armload. Of course, that is what is going to happen tonight. Meanwhile, Mikey and I still have work to do and therefore my review this evening will have nothing to do with Mexico, Mexican food or booze of any kind. What you probably don’t know is that Germans make up one of the largest foreign groups in Mexico. The German people are also the reason why Dos Equis is so awesome, thanks to the import of their lager style beer. It is in honor of that contribution, on this largest of Mexican holidays, that I give you this review: a genuine German deli. Sometimes the best gifts come in ugly wrapping. I’ve personally never gotten a cool gift in anything other than cool wrapping, but now that I’ve had Rhineland Deli, I at least know what those poor suckers mean. This place is in a rundown little shopping center right next to The Lakes, Thousand Oaks’ newer, slightly snootier, shopping experience. It’s right by a donut shop and a mexican restaurant but if you aren’t looking for it, you’re sure to miss it. Anyway, here is what the sign looks like. Maybe that will help. Despite it’s rundown appearance, this place has been around for years. My family has been getting meat and cheese here on and off for the better part of a decade. I recommend that you view this place as a takeout joint. They have a few tables, but I think the max occupancy is about 12 and it’s basically just for people who want to scarf a sandwich at lunchtime. Speaking of lunch, that’s as late as it gets for this place. There is no dinner service, but they do stay open ’til 6pm during the week and possibly later on the weekend. 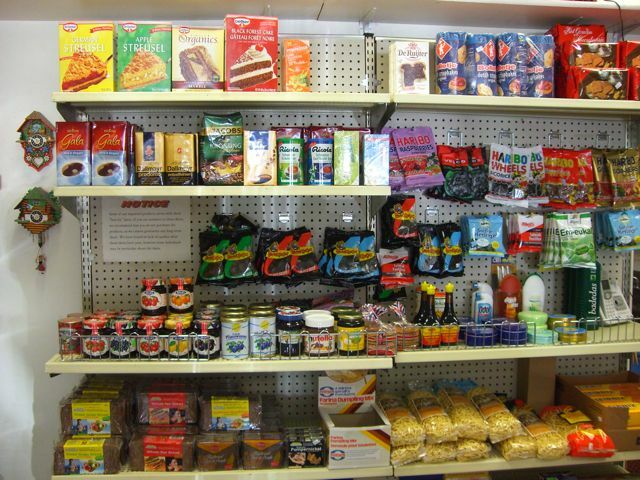 Aside from the sandwiches, meat and cheese, this place has all of the German pantry items that you’ve been secretly wanting, but had no idea what they were. Here you can buy them in relative anonymity. Oh, and guys, if you want to buy your girl some chocolate that she won’t think came from the gas station, they’ve got you covered too. A couple years back, I was on a wild goose chase for a specific dumpling mix. I went to no less than eight different grocery stores before remembering Rhineland. Of course, they had the exact brand I was looking for and I was stuck feeling like a moron for driving around for two hours to every Ralph’s, Von’s, Jon’s, Ron’s or whatever the hell. Needless to say, I learned my lesson that day. Now, back to the sandwiches, of which there are many. As far as I’m concerned, there can only be one king. And that king is the pastrami on rye. There is an art to the pastrami sandwich, and I’ve rarely had better than the product of Rhineland. I have my opinion on pastrami and it’s pretty simple: Put the meat on the bread with a little mustard and that’s it. No cheese. It just takes away from the flavor of the meat. Also, the mustard is key. Too much and the bread will get soggy, too little and you don’t get the sour bite that really sets off the rye. This is your view inside a “small” pastrami sandwich from Rhineland Deli. As you can see the pastrami is sliced thin and piled high (about 2 inches or so on average). You can see that they lovingly applied just the right amount of mustard to the rye. The bread mainly serves as a kind of glove, to keep you from getting as messed up as you would were you to just shove the pastrami into your mouth. The great thing about Rhineland’s rye is that it is soft in the middle, but hardens up a bit near the crust which gives you a nice little break from the savory part of the sandwich. The meat itself is tender and juicy. It has just the right about of pepper and burnt edges that are the definition of savory. Pastrami is not a lean meat. In fact, it’s the fat that gives you all the flavor. 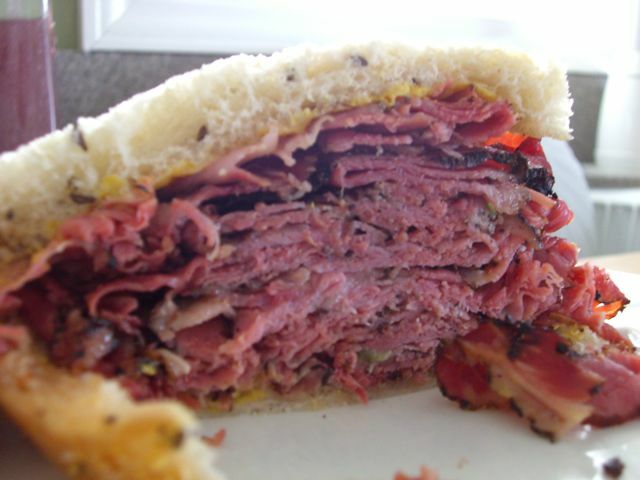 However, the key to a great pastrami is that it cannot be gristly. The fat on Rhineland’s pastrami just melts away, leaving you with tender meat to sink your teeth into. It is because of this quality that you can take a big bite and not have to worry about pulling all the pastrami right out of the sandwich. Just because I love the pastrami, doesn’t mean that you will. 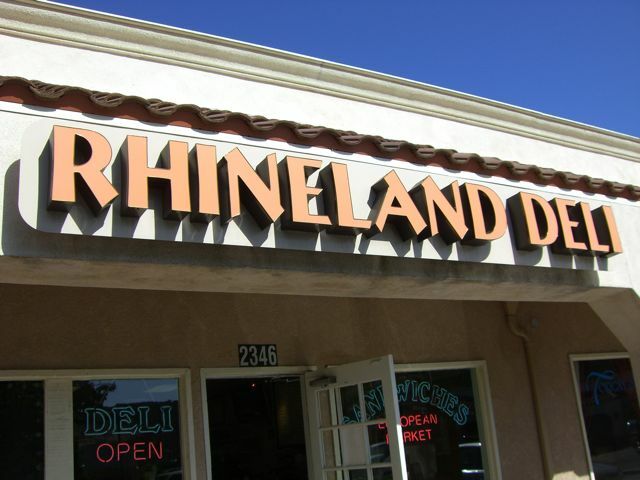 (But you really will, I swear) So if you’re in the mood for something different, rest assured that Rhineland Deli can make you something delicious. 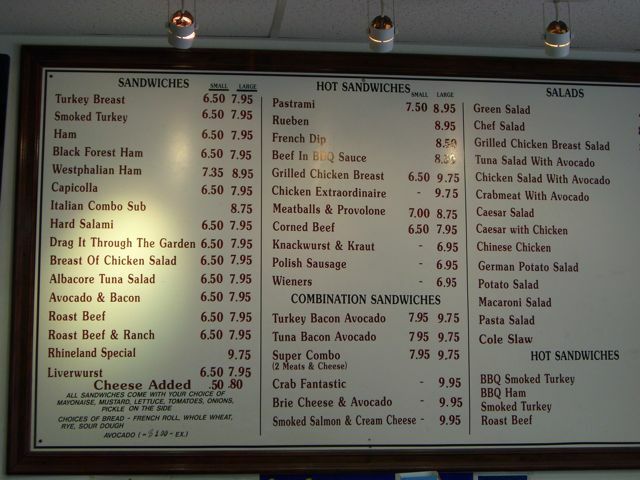 Here’s a picture I snapped of their menu. The prices may seem high when compared to your Subways and Quiznos. But you have to understand that those places serve low quality meat and processed cheese. All the ingredients here are top notch. Also Rhineland sandwiches tend to be a bit more vertical, instead of the four flattened slices of cheap turkey that you get at subway. Their double meat is a quarter of what Rhineland gives you for just a couple bucks more. 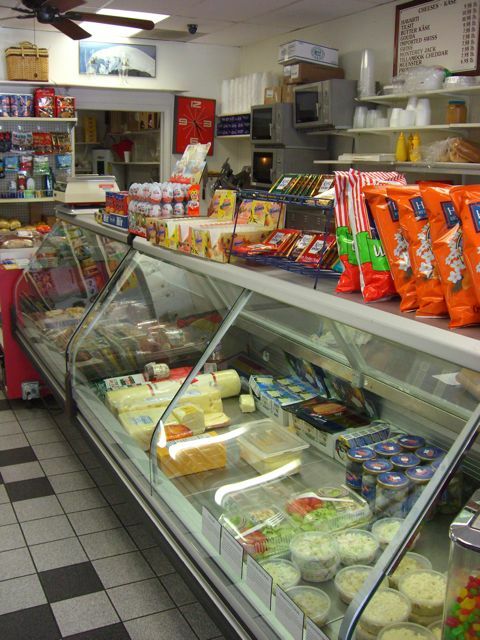 Any way you slice it, Rhineland Deli sandwiches can’t be beat. The pastrami I bought, intending to save 1/2 for tomorrow, is now completely entombed inside my belly. One that note, I’m off to get a workout. Have a good cinco de drinko and be safe. We need you alive to keep reading this stuff. I am going to have to check this place out! That would be a good call. I think I might have to go back for another sammie.